Letters of Note: Is there a space program which we could win? 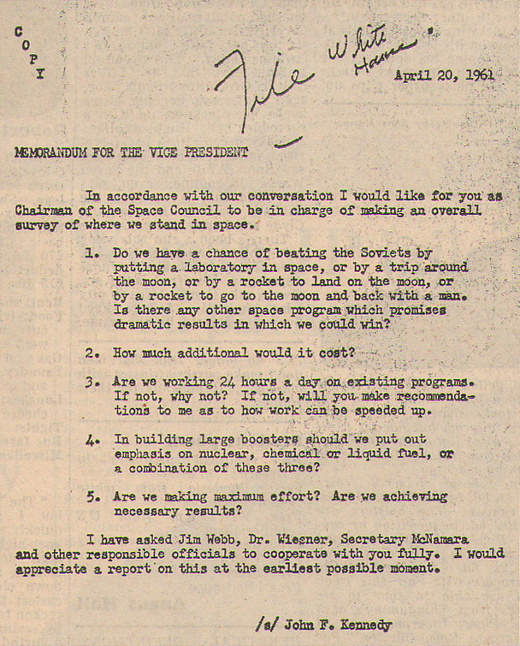 On April 20th of 1961, a despairing John F. Kennedy sent the following memo to his Vice President and Chairman of the Space Council, Lyndon B. Johnson. Just 8 days previous, on the 12th, the Soviets had strengthened their lead in the Space Race by successfully sending cosmonaut Yuri Gagarin into orbit; in addition, a failed invasion of Cuba just days later had only served to heap further embarrassment on the Kennedy administration. Clearly the President realised - now more than ever - that a "dramatic" victory of some sort was sorely needed. The next month, Kennedy announced plans to land a man on the Moon before the end of the decade. Recommended reading: Red Moon Rising: Sputnik and the Hidden Rivalries that Ignited the Space Age. In accordance with our conversation I would like for you as Chairman of the Space Council to be in charge of making an overall survey of where we stand in space. 1. Do we have a chance of beating the Soviets by putting a laboratory in space, or by a trip around the moon, or by a rocket to go to the moon and back with a man. Is there any other space program which promises dramatic results in which we could win? 2. How much additional would it cost? 3. Are we working 24 hours a day on existing programs. If not, why not? If not, will you make recommendations to me as to how work can be speeded up. 4. In building large boosters should we put out emphasis on nuclear, chemical or liquid fuel, or a combination of these three? 5. Are we making maximum effort? Are we achieving necessary results? I have asked Jim Webb, Dr. Wiesner, Seceretary McNamara and other responsible officials to cooperate with you fully. I would appreciate a report on this at the earliest possible moment.